Publication: Friday, December 7, 2018. DataHawk is a web-based Amazon Analytics Tool that combines a Keyword Ranking Tracker, a Product Tracker, a Market and Keyword Analysis tool, and a Product Research engine. This is a blog post where we share some insights on the number of Amazon sellers and their growth, including the largest ones. Amazon is the largest online retailer in the world and one that doesn’t show any signs of slowing down in the distant future. Ever since 2002, when small businesses started selling on Amazon, the online retail giant has been growing and paving its way to becoming the platform we know and love today, further helped by its launch of the Fulfillment by Amazon program in 2006. As Amazon dominates international reach among marketplaces, Amazon sellers today have an extraordinary opportunity to reach 1.2 billion people across 58 countries. Amazon helped a lot of US-based small and medium-sized businesses that sell on the platform by lending them more than $1 billion in 2017. There are now more than 1 million US sellers on Amazon, 300,000 of which joined the online retail platform in 2017 to start selling their products. However, a very small number of all the worldwide sellers was actually capable of building a strong business. Let’s have a look at the numbers that paint a better picture of the growth of Amazon sellers. According to an annoucement by Amazon, out of the 3 million estimated Amazon sellers worldwide, only about 20,000 managed to generate more than $1 million in sales in 2017, representing 0.7% of total registered sellers. This figure is very close to data estimated by other market research firms. According to the latest research by Marketplace Pulse, more than 15,000 Amazon sellers across the world generated more than $1 million in sales last year, which is definitely not very far off from the official number provided by Amazon. There are now more than 140,000 Amazon sellers who generate more than $100,000 in sales every year. The high-growth in large-volumes sellers continues with a 40% growth in 2017 in sellers doing over $100,000 in sales. According to the research mentioned above, 51.5% of Amazon sellers are US-based, which leaves 48.5% of other sellers worldwide. All the US-based sellers that make up more than half of all Amazon sellers come from seven states: California, New York, Florida, Texas, Illinois, New Jersey, and Pennsylvania. There are 18% of Amazon sellers located in California, 8.3% in New York, 7.7% in Florida, 6.4% in Texas, 3.9% in Illinois, 3.7% in New Jersey, and 3.6% in Pennsylvania. 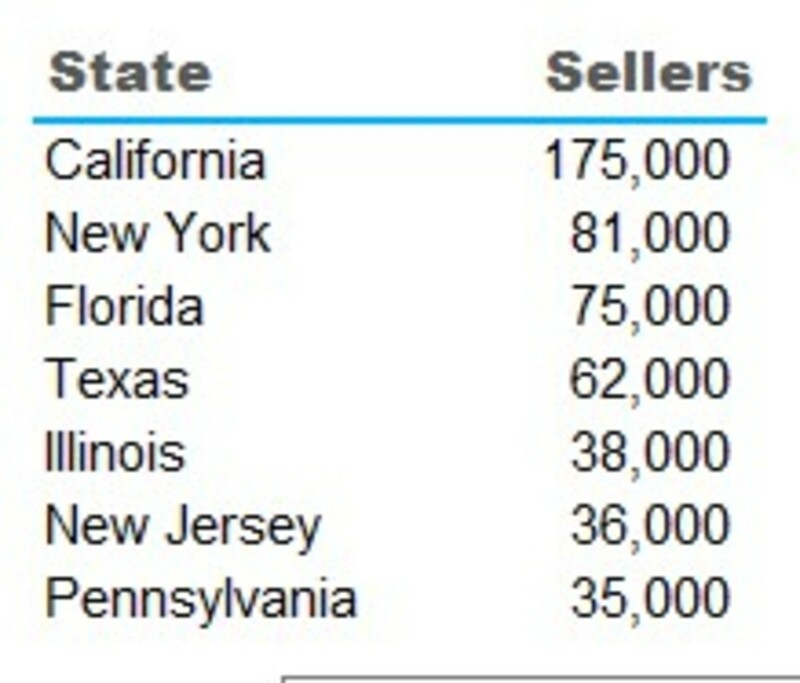 The number of Amazon sellers by state, concerning these top states in the United States. There are not many sellers on Amazon who can say that they make millions of dollars in sales every year. As you could see from the first chart above, there are only 4,750 sellers who make $2.5 million in sales on an annual basis, while those generating more in sales are considerably fewer. Nevertheless, the top sellers on Amazon are pretty much the same every year. Those who were at the top a few years ago still hold that same position. That’s primarily because they have already built strong foundations since they have been selling their products for many years now. This remains the case when you look at the 20,000 Amazon sellers who make more than $1 million in yearly sales. 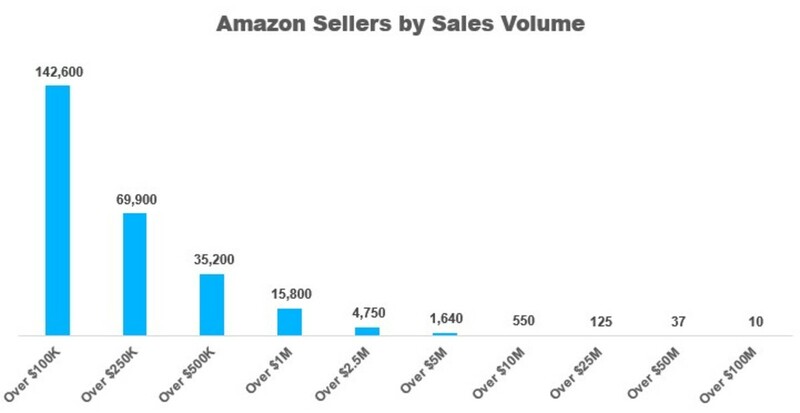 Since about half of all Amazon sellers are selling in the United States, we could make a far-fetched assumption that about 10,000 US sellers are doing north of $1M in sales yearly. 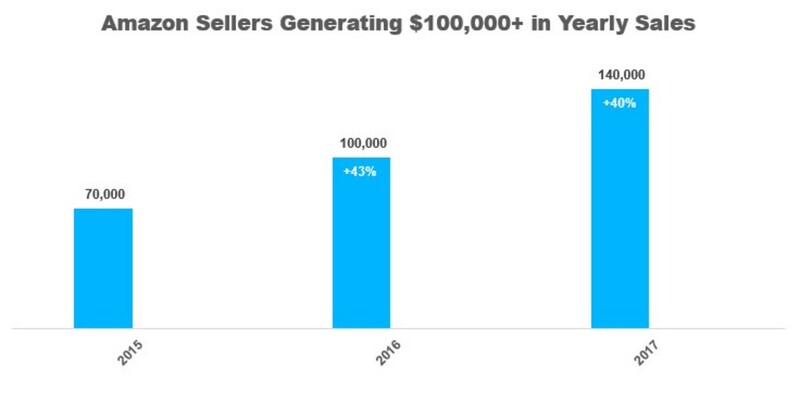 According to another Marketplace Pulse research, 66% of 2018's 10,000 US sellers doing north of $1M in sales were also doing as much in 2017, 50% were doing as much in 2016, and 35% were doing as much in 2015. When you factor in the growth that most of those may have hed, propelling most of them above the $1M in sales threshold, this shows that the Amazon marketplace has a relatively strong retention rate amongst top sellers, meaning the annual percentage rate at which the top sellers on the marketplace disappear from the top rankings or have decreasing sales is relatively weak. Those figures also reflect to what extent the marketplace is highly competitive and gives everyone her or his change, with a lot of smaller sellers growing fast and reaching large sales volumes, further squeezing other competitors. Indeed, the sellers change a lot on the Amazon marketplace, as there are constantly new competitors popping up, benefiting from the extent to which it is now easier than ever to launch a brand. Thousands of new sellers start selling their products on Amazon every single day, which only strenghtens the dynamics of the marketplace and cements Amazon's position as a leading global online retailer and marketplace. Amazon manages to do so because it consistently attracts both new sellers and new customers, both of which are absolutely necessary for a good online retail system. The Internet giant has been doing it for years, which is precisely why the system functions so well and will undoubtedly continue to do so for many years to come. Based in Paris, France. Registered in Tallinn, Estonia.